My Whitten Project reminded me of just how much information can be found using Ancestry.Com. Really, it is an amazing resource. In the case of my researching Herbert Winfield Whitten, I found a lot of information on Family Search, some on Find My Past, and even some on Mocavo. However, every one of the sources I found on those other sites I also found on Ancestry.Com. If you can afford it, it is the one paid site I recommend above all others. If you want to get an Ancestry.Com membership and you are an AARP member, call them (don’t use the on-line forms) and tell them you would like the one-time AARP Member Discount. If you can’t afford an Ancestry.Com membership, you can access the “Library Edition” of Ancestry for free from most public libraries and from all Family History Centers. If you are not currently an Ancestry.Com subscriber, you might want to consider subscribe by using my Ancestry.Com link. (See my disclaimer.) Here is what I found using Ancestry.Com. When Herbert Winfield Whitten was born on September 3, 1883, in Limerick, Maine, his father, Daniel, was 23 and his mother, Martha, was 20. He married Frances Florence Murphy on September 19, 1911, in Biddeford, Maine. They had five children in 17 years. He died on October 26, 1967, in Maine, at the age of 84. 1887 – Herbert Winfield’s brother Charles Libby was born about 1887, in Maine when Herbert Winfield was 4 years old. 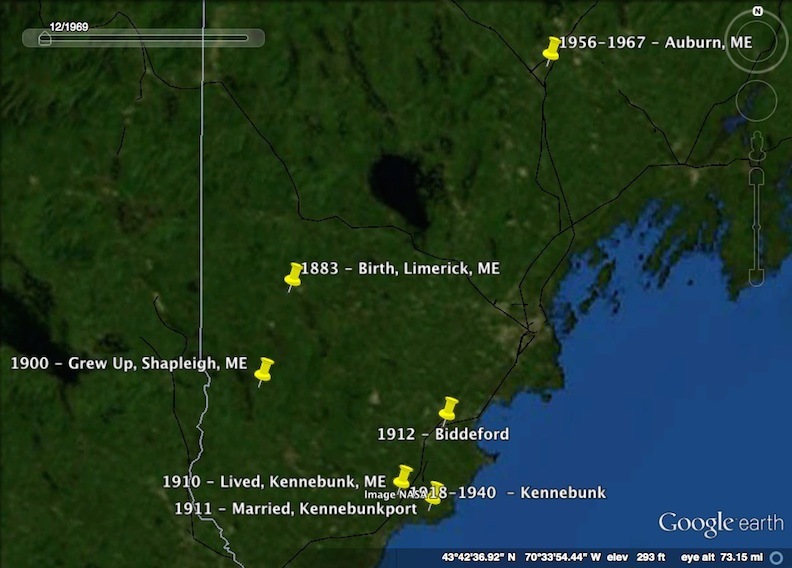 1900 – The 1900 census finds Herbert living with his parents and his two siblings in Shapleigh, York County, Maine. Herbert is a spinner at a woolen mill. Shapleigh is just a few miles south of Limerick, where Herbert was born. 1901 – Herbert’s brother Neuren (or Newren) was born about 1901, in Maine, when Herbert was around 18 years old. 1905 – Herbert’s youngest brother, Leland, was born about 1905, in Maine, when Herbert was about 22 years old. 1910 – The 1910 Census finds Herbert living with his parents and his four siblings on Kennebunk Road, in Kennebunk, Maine. His father was owned a farm and was work as a farmer while Herbert worked as a Teamster. 1911 – Herbert Winfield Whitten married Frances Florence Murphy, Daughter of Dennis F Murphy and Margaret Alice (Mahoney?) Murphy on September 19. The ceremony was performed by Rev. Timothey P. Limeton, a Biddeford clergyman, in Frances’ hometown of Biddeford. Herbert was living in Kennebunkport at the time and was 28 years old Plain (Plane?) Operator. 1918 – The 35-year-old registered for the draft (WW I). He was described as short, medium build, brown hair, brown eyes. He lived on Lived on Nasons Court in Kennebunk, ME, working as a teamster for William Bartlett on Saw Road. His wife was his nearest relative. 1920 – The 1920 Census indicates that Herbert and his wife, Frances, were renting a house on Main Street in Kennebunk, Maine. Herbert was a laborer in a leatheriod(?) shop. With them are their two sons, Paul and Frances. 1922 – About 1922 his first daughter [still living] was born in Maine. 1926 – About 1926 his fourth child (third son) Erin (or Errin) was born in Maine. 1929 – In September or October 1929, Herbert’s youngest child, Millard was born. 1930 – The 1930 Census indicates that Herbert is renting a house on Lewis Court in Kennebunk with his wife and five children. Herbert worked as a laborer at a machine shop but had been unemployed for the past 19 weeks. Herbert is not a veteran. His three oldest children are all attending school. 1940 – The 1940 Census indicates Herbert is renting a house at 319 Garden, in Kennebunk, for $12/month. Living with him are his wife, Francis, and his four youngest children. He is a laborer doing odd jobs and his son Francis is a mechanic at a garage. 1954 – Herbert’s brother Neuren died. 1958 – Herbert is still retired, living on Beech Hill Road in Auburn. 1960 – Herbert’s son, Paul passed away in Auburn, Maine. 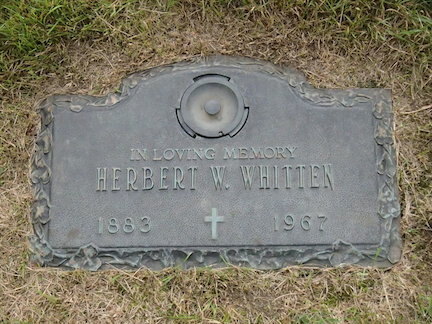 1967 – Herbert Winfield Whitten died on 26 October 1967, probably in York, Maine. He is buried at Gracelawn Memorial Park in Auburn, Maine. Ancestry.com, Maine, Birth Records, 1621-1922 (Provo, UT, USA, Ancestry.com Operations, Inc., 2010), Maine State Archives; Cultural Building, 84 State House Station, Augusta, ME 04333-0084; Pre 1892 Delayed Returns; Roll #: 104. Ancestry.com, 1900 United States Federal Census (Provo, UT, USA, Ancestry.com Operations Inc, 2004), Year: 1900; Census Place: Shapleigh, York, Maine; Roll: 603; Page: 10B; Enumeration District: 0253; FHL microfilm: 1240603. Ancestry.com, 1900 United States Federal Census (Provo, UT, USA, Ancestry.com Operations Inc, 2004), 1900; Census Place: Shapleigh, York, Maine; Roll: 603; Page: 10B; Enumeration District: 0253; FHL microfilm: 1240603. http://search.ancestry.com/cgi-bin/sse.dll?db=1900usfedcen&indiv=try&h=2705110. Ancestry.com, 1910 United States Federal Census (Provo, UT, USA, Ancestry.com Operations Inc, 2006), Year: 1910; Census Place: Kennebunk, York, Maine; Roll: T624_548; Page: 10A; Enumeration District: 0245; FHL microfilm: 1374561. Ancestry.com, 1910 United States Federal Census (Provo, UT, USA, Ancestry.com Operations Inc, 2006), 1910; Census Place: Kennebunk, York, Maine; Roll: T624_548; Page: 10A; Enumeration District: 0245; FHL microfilm: 1374561 – David W. Whitten. http://search.ancestry.com/cgi-bin/sse.dll?db=1910USCenIndex&h=196551176&indiv=try. Ancestry.com, Maine, Marriage Records, 1713-1937 (Provo, UT, USA, Ancestry.com Operations, Inc., 2010), Maine State Archives; Augusta, Maine, USA; 1908-1922 Vital Records; Roll #: 60. http://search.ancestry.com/cgi-bin/sse.dll?db=MaineMarriageRe&h=1028162&indiv=try. Maine Birth Records, 1621-1922 (84 State House Station, Augusta, ME 04333-0084, Maine State Archives), Ancestry.com, Timothy Paul Whitten – Vital Records; Roll #: 60. 1920 United States Census (FS) (National Archives and Records Administration), Family Search, Maine, York, Kennebunk, ED-109, Sheet 2B Line 36 (family 51). Ancestry.com, 1930 United States Federal Census (Online publication – Provo, UT, USA: Ancestry.com Operations Inc, 2002.Original data – United States of America, Bureau of the Census. Fifteenth Census of the United States, 1930. Washington, D.C.: National Archives and Records Administration, 1930. T626,), Year: 1930; Census Place: Kennebunk, York, Maine; Roll: 841; Page: 8B; Enumeration District: 0022; Image: 780.0; FHL microfilm: 2340576. Ancestry.com, U.S., World War I Draft Registration Cards, 1917-1918 (Provo, UT, USA, Ancestry.com Operations Inc, 2005), Registration State: Maine; Registration County: York; Roll: 1654023; Draft Board: 2. Ancestry.com, 1920 United States Census (FS) (National Archives and Records Administration), Family Search, Maine, York, Kennebunk, ED-109, Sheet 2B Line 36 (family 51). Ancestry.com, 1940 United States Federal Census (Provo, UT, USA, Ancestry.com Operations, Inc., 2012), Year: 1940; Census Place: Kennebunk, York, Maine; Roll: T627_1496; Page: 14B; Enumeration District: 16-38. Ancestry.com, 1940 United States Federal Census (Provo, UT, USA, Ancestry.com Operations, Inc., 2012), 1940; Census Place: Kennebunk, York, Maine; Roll: T627_1496; Page: 14B; Enumeration District: 16-38. U.S. City Directories, 1821-1989, Ancestry.com, Lewiston, Maine – 1956 – Page 865. U.S. City Directories, 1821-1989, Ancestry.com, Lewiston, Maine – 1958 – Page 836. Ancestry.com, U.S., Find A Grave Index, 1600s-Current (Provo, UT, USA, Ancestry.com Operations, Inc., 2012), Herbert W Whitten – # 121465477.